One of the best day trips out of Moab, Utah that I know is to the Anticline Overlook at Hatch Point, south of town in San Juan County. To get there; take U.S. Highway 191 South thirty-three miles to the Needles/Anticline Overlook Road turnoff. According to my DeLorme Utah Atlas, the Needles/Anticline Overlook Road becomes the Anticline Overlook Road and as you approach your destination, it becomes the Hatch Point Road. Google Maps simply calls it the Needles Overlook Road, but if you follow their road names, you will detour on to a misidentified portion of County Road 133. After you pass the Needles Overlook turnoff, things change. From that point on, the road is graveled and Google gets it right, calling it the Hatch Point Road. Most GPS units will get you to the Anticline Overlook without any detours. While conducting research for this article, we found disagreement on the proper name for the Anticline Outlook. Since there are two Creeks in the area with similar names (Cane Creek and Kane Creek), many websites tend to confuse the two. The proper name for the anticline itself is the “Cane Creek Anticline”. Ironically, when you stand at the Cane Creek Anticline Overlook on Hatch Point, the creek that is directly below you is Kane Creek. If you take a few steps back from the precipice and look across the Colorado River toward the center of the collapsed anticline, the unseen Cane Creek descends at a place called Potash. For simplicity, I shall call our destination the shorter, “Anticline Overlook”. 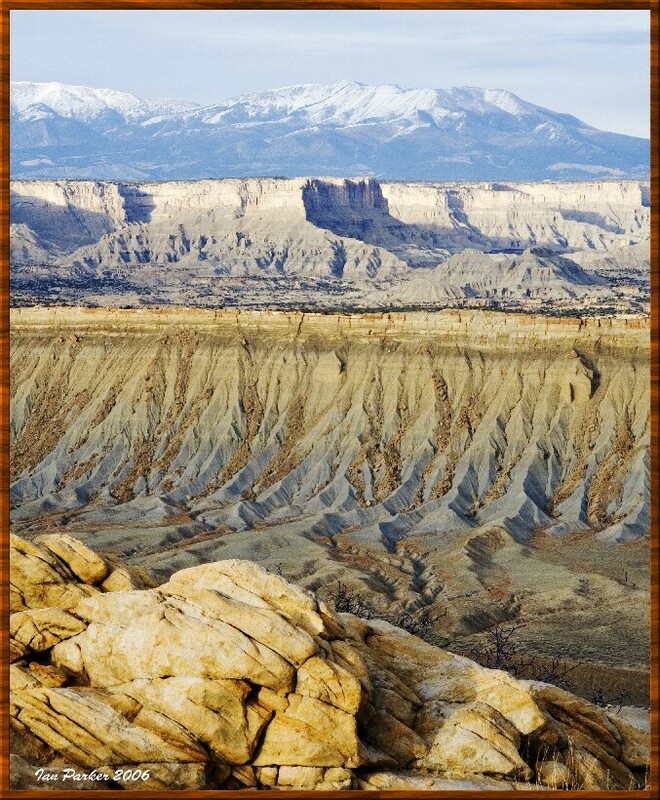 The Anticline Overlook is located in the BLM controlled Canyon Rims Recreation Area, which spans most of the area between Moab and Monticello, to the south. Located just off the road, several miles from the overlook, there is the BLM Hatch Point Campground, with nine campsites. If you camp there, be sure to plan well, as it is almost sixty miles and several hours travel time to Moab. Only six miles in from U.S. Highway 191, the Wind Whistle Campground has fifteen campsites and easier RV access. All of the websites I checked indicate that the graveled road to the Anticline Overlook is well graded and properly maintained. Although that may be true, there is a tendency to get overconfident while speeding along that road. I use the word “speeding”, because many visitors ignore the speed limits and rocket down the road at full speed. On one visit, I was guilty of speeding and found my rental car drifting on top of the gravel as if it were ice. Luckily, the car had a warning light that came on when traction was lost. Thinking that I could avoid mishaps so far from town, on my next visit, I stayed much closer to the posted speed limit. What I did not count on was oncoming traffic. Just after a small SUV passed me going the other way, I heard a loud crack as a rock hit my windshield. Over the next few minutes, the resulting star-shaped crack propagated like a snake slithering across the glass. The speeding SUV driver never knew what he or she had done. Although the Needles Overlook is closer to the highway and is accessible on a paved road, I prefer taking the longer route and visiting the Anticline Overlook. With fewer visitors willing to risk traveling fifteen miles on a gravel road, you might find yourself alone at one of the grandest vistas in all of the Southwest. At the same moment that you stand alone, listening only to the breeze, thousands of people might be at the South Rim of the Grand Canyon, downstream in Arizona. The Grand Canyon is deeper and wider, but to me, the view at the Anticline Overlook is every bit as awe-inspiring. At Hatch Point, the Anticline Overlook is at 5700 feet elevation. Hurrah Pass, directly below is at 4780 feet. Potash, along the far bank of the Colorado River is at 4025 feet. In other words, from the overlook to the river is about 1700 vertical feet. For perspective, the new 1 World Trade Center building in New York City will top out at 1776 feet. Make no mistake about it; at the Anticline Outlook, you are way up there. The good news is that you are standing on a sturdy mesa, with desert plants and weathered rocks all around. Unless you hang your head over the rail and look straight down, there is little of the vertigo producing effect of standing on top of a high building. Sturdy steel piperails help add to your feeling of security. Since the Cane Creek Anticline is like a huge bubble of stone on the surface of the Earth, from your vantage point you can see and almost feel the Earth’s curvature. From the overlook, there is an unobstructed view south to the Abajo (Blue) Mountains. On a clear day, you will see the Henry Mountains farther south. Looking southwest across the Colorado River, you will see Dead Horse Point State Park. Directly to the west, are the brightly colored settling ponds at Potash. Looking upstream beyond Potash, the backside of the Moab Rim hides your view of Moab. The Portal, which is the natural river-cut through the Moab Rim looks like a small notch in such a large landscape. Over the top of the Moab Rim, you will get a glimpse of the Big Bend area along the Colorado Riverway. On the horizon to the north, you will see the Book Cliffs, beyond Crescent Junction. After taking in the view, see if you can find the Ancient Spirit of the Anticline. Near the farthest and highest spot at Hatch Point, he reclines beneath a protective rock ledge. With eyes that simultaneously look east and west, he rests there, and watches as the Colorado River slowly washes away untold volumes of land below him. When he first stopped to rest there, the anticline was whole, blocking the eroded views that I just described. After waiting with great patience for eons to pass, he appears to smile as he looks out on one of the best views in the world.